Manchester United kept up their pursuit of a top-four finish thanks to a Juan Mata strike in a game that was short on chances and poor in quality. 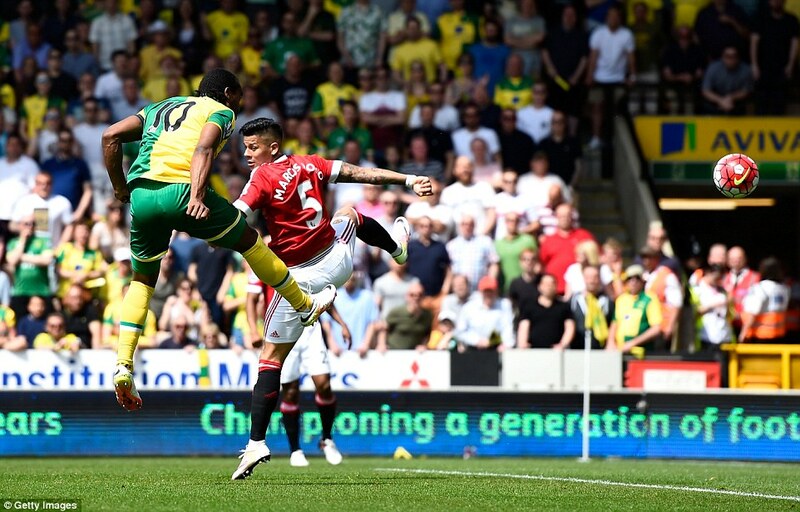 Norwich desperately needed a win to have any chance of staying in the Premier League whereas United looked to gain another three points to hang on to the tails of the teams sat above them. 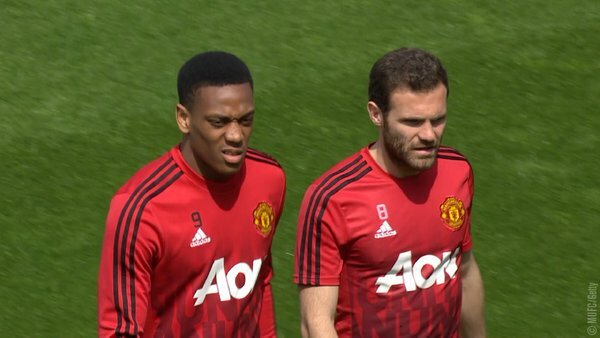 Louis van Gaal made wholesale changes to his starting line-up including a forced change after Martial complained of not feeling fit during the warm up. It was the same situation that gave youngster Rashford his big opportunity that he took so well against Arsenal. However, the manager decided against making the same swap this time around. Starting XI: De Gea, Valencia, Smalling, Rojo, Darmian, Carrick, Herrera, Mata, Lingard, Memphis and Rooney. With the midweek game against West Ham on the horizon van Gaal decided to rest Blind and used a center-back pairing of Smalling and Rojo with Valencia and Darmian as full backs. In midfield, there were recalls for Mata and Herrera with Rooney used as the lone forward. Memphis was handed a rare start in a season he would want to forget in a hurry. 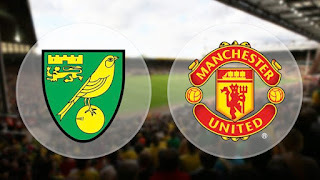 On a bright East Anglian day, Norwich got the game underway with the brilliant Red army of supporters in fine voice celebrating the fact that United were going to Wembley and the Canaries were on their way to the Championship. The Red Devils dominated the game at the start without any urgency and seemed happy to try and control the game and nullify the home side and their fans. However, it was the home team that came the closest to scoring when as early as the fourth minute Jerome looked odds-on to score, but there was United’s player of the season David De Gea to literally put his body on the line for the cause to superbly block the headed effort. 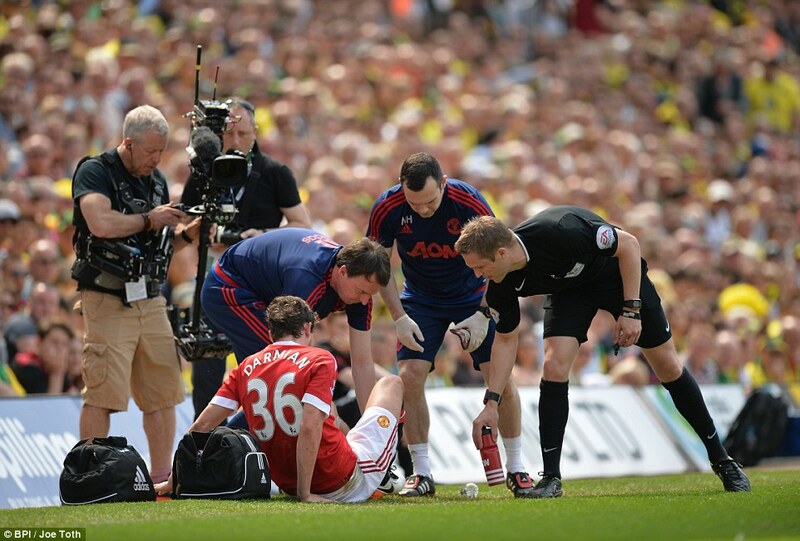 United full back Darmian became an early casualty as he was stretchered off following a clash with Pinto and had to be replaced by Borthwick-Jackson. Just before the half-hour mark Smalling rose the highest for a corner and powered a header inches over the bar to register the closest chance of the match up to that point for the Reds. Not for the first time in a season low on goal scoring chances United pressed high up the field and played some nice passes around the edge of the oppositions penalty area without actually creating an opening, frustrating to say the least. 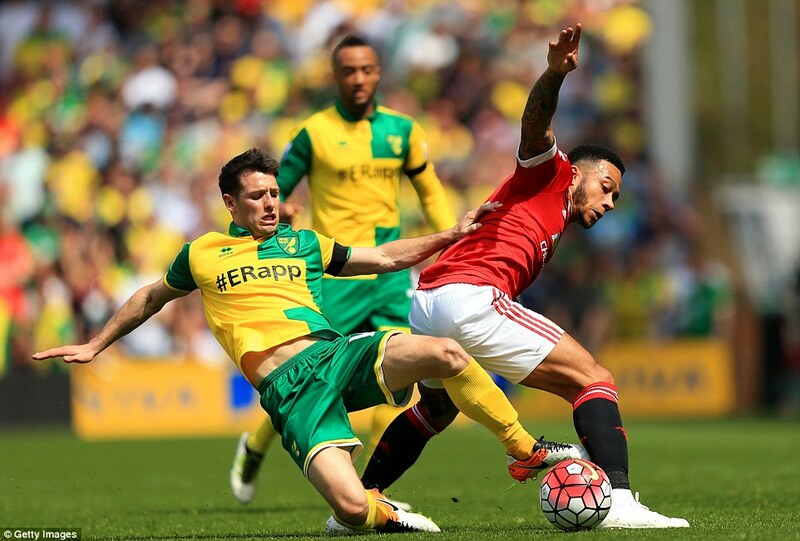 The away side were awarded a free-kick in a dangerous area after Lingard was upended. The resulting kick was taken by Memphis who blasted the ball straight into the wall. Yet another wasted free kick by a player who should do better when the opportunity arises in those situations. As half time approached Memphis stretched his legs down the left wing and his run took him into the penalty area where he was tackled all too easily and the attack broke down. That summed up the Dutch wingers season. Half time and the two teams were locked at 0-0 in a half that was so lacklustre van Gaal was probably wearing shades to hide the fact that he had nodded off in the sunshine. The main talking point had to be the injury to Italian defender Darmian and the hope that it would turn out not to be as serious as it had initially appeared as he joined the bench for the remainder of the match wearing a brace on his injured left ankle. United started the second half having made no changes and immediately went on the attack as they tried to find the all-important opening goal and it was Herrera who came the closest as he volleyed his snap shot into the side netting. The Under 21 player of the season Borthwick-Jackson made some decent forays down the left unfortunately, Memphis wasn’t on the same wavelength as the youngster. 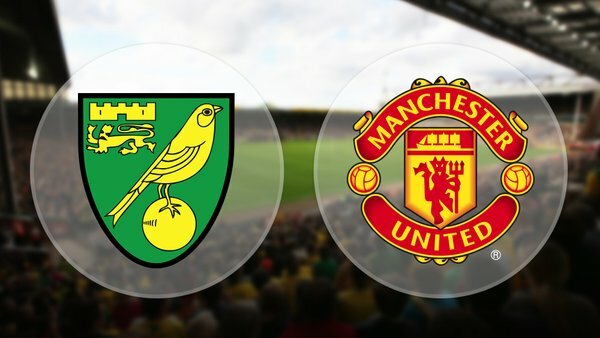 In the opening quarter of an hour, United were camped in Norwich’s half as they searched for just one break but Norwich held firm as they had to if they wanted any chance of staying in the top flight. Mata and Herrera were as industrious as ever but you could see that they needed more of a threat to aim for up front as Rooney laboured on his own. It seemed that if a goal was forthcoming it would be one of the Spaniards who would be heavily involved. Rojo was next to try his luck with a header from a corner but it bounced wide of the far post. Norwich did, at last, get the home crowd on their feet when they pressed the United defence in a two-minute spell which amounted to, basically, nothing. Eventually United’s approach play paid off in the 71st minute when Valencia played a long ball out of defence which Rooney collected and purposely strode into the box as soon as he realised he didn’t have an opening he cleverly spun around and delivered the ball on a plate for Mata whose left-footed strike gave the keeper no chance and put United into a deserved lead. Van Gaal decided the time was right for a change and replaced Lingard with Schneiderlin for the last fifteen minutes. 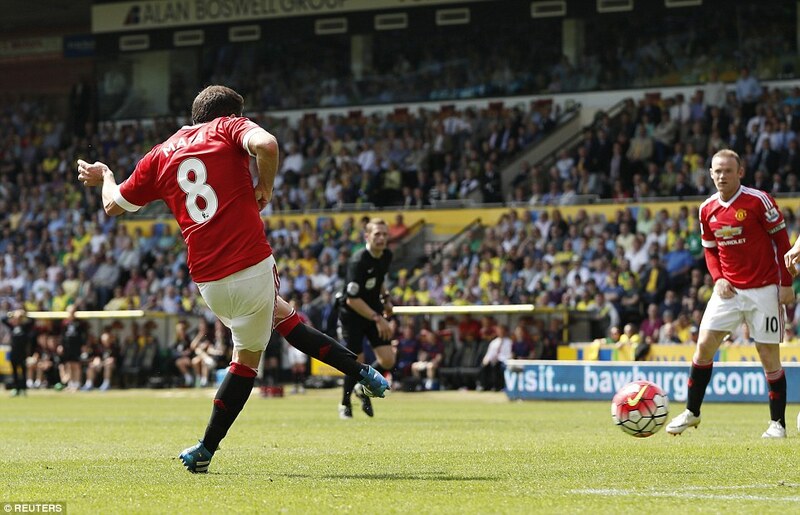 Interestingly, prior to the goal forgotten man Januzaj was about to make his entrance. 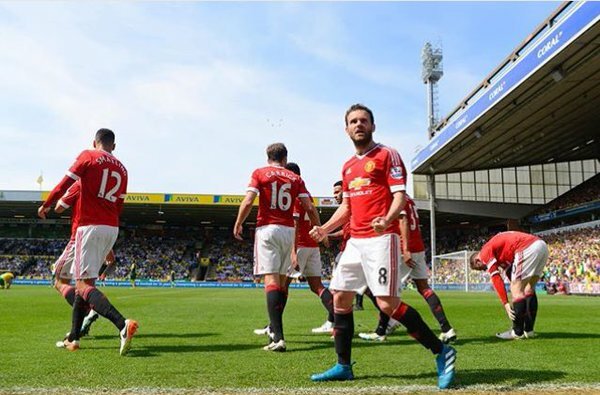 That all changed once Mata had scored. Memphis once again flattered to deceive on the left wing as he squandered two opportunities to play decent crosses to his teammates much to the despair of Rooney and Mata who had made excellent runs to get on the end of the expected ball that never materialised. There was a clear chance for Schneiderlin to seal the game after Rooney had set him up, but unfortunately he pulled his shot well wide. The last change of the match saw the impressive Fosu-Mensah come on for Carrick in the last few minutes which produced smiles on the away bench as once again Januzaj was stripped and ready for action only for van Gaal to have a change of mind. 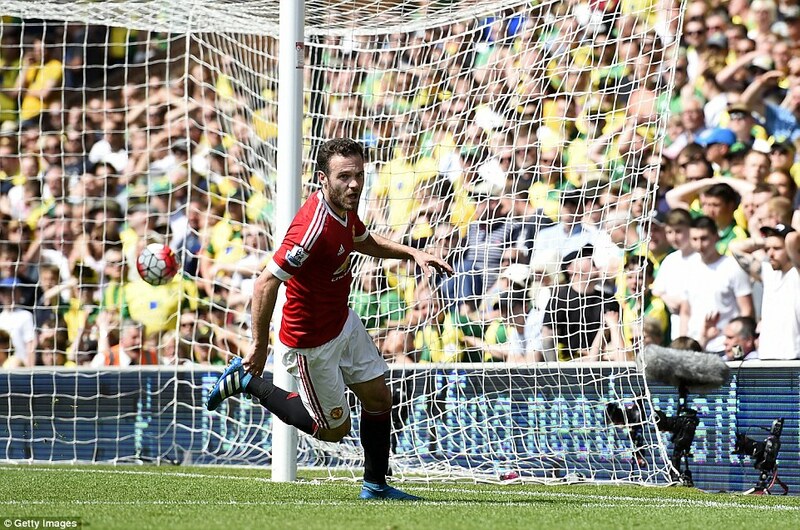 There was one last chance for the away side after goal hero Mata was unceremoniously dumped on his backside. Memphis took the resulting free kick and came within a whisker of adding a second. The last shot of the game fell to Herrera who hit his effort high and wide which summed up the quality of the match both sets of fans had been forced to witness. Full time and another important win and three points for United in their quest for a finish in the top four. So many times this season it has been said that the result was more important than the performance, which has never been more so than in this match. For all the possession United enjoyed they still made hard work of killing of a team that in ninety minutes only troubled De Gea once. It’s difficult to choose a player for the man of the match after so many below average performances, so Valencia gets the nod for his effort. Maybe Januzaj should get a special mention for at least providing the entertainment by taking the time to get ready for action, not once, but twice only not to be used at all. With two matches left to play, United will be sweating on how local rivals City get on at home to Arsenal before their trip to play West Ham in mid-week for the last ever match at Upton Park when the Hammers will be aiming for revenge for the FA Cup defeat United inflicted on them last month. Previous United Fail To Outfox Leicester.